A cat has to be very comfortable with his surroundings to sleep on his back. All of our cats do this from time to time, especially Floki. 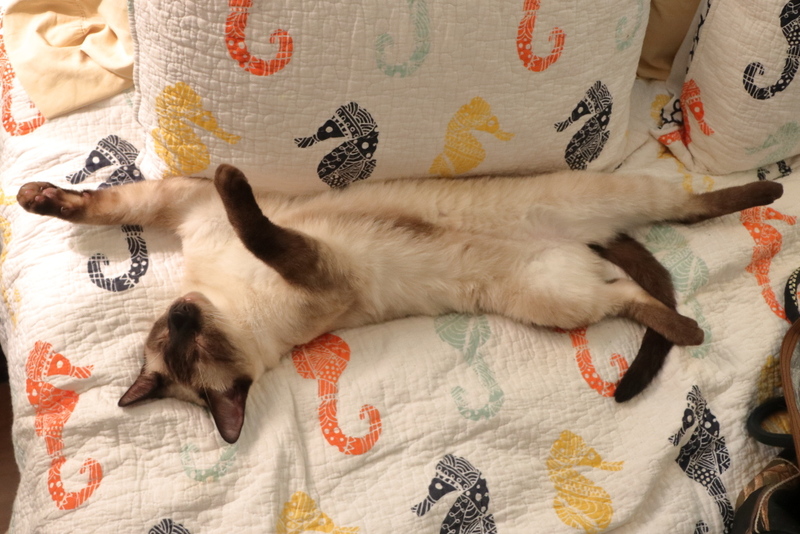 This entry was posted in Uncategorized and tagged cat, cute, Siamese, sleep on July 27, 2018 by Charles Huss. Teddy is also big on “back naps”…..my husband says he looks like a giant, lumpy throw rug in the hallway. Floki looks quite comfy! Hopefully, nobody is tempted to step on him. It is common but I wonder if outdoor cats sleep like that. I understand that. Too many unknowns outside. Binga and Boodie are great back sleepers. Me, not so much – I prefer to stretch out on my stomach. Which looks odd, but is quite comfortable in its own way. Oh to have the life of a cat! Floki is just like Cody! I posted a photo on Instagram the other day where Cody is doing the same thing MOL! I missed that one. Will have to look for it. Your picture caught our eye and did make us smile such a lot!